Author Chris Hare knows the meaning of “polymath”―but is too modest to use it about herself. How does she do it all? It’s this kind of relatable wit that is infused in her insightful new book: “From Homework Hell to Help! 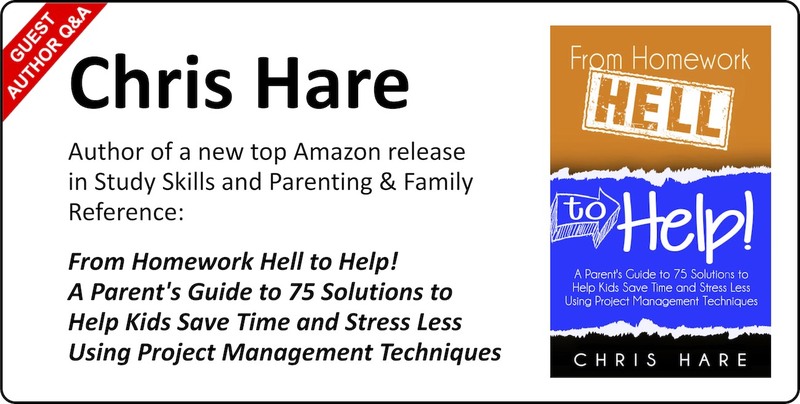 A Parent’s Guide to 75 Solutions to Help Kids Save Time and Stress Less Using Project Management Techniques.” In its first two weeks on Amazon, it garnered an impressive “Amazon Hot New Releases” top ten ranking for both Parenting & Family Reference and Study Skills categories. SMG: So, where did the idea for this book come from, Chris? CH: Basically, it was born out of the underpinnings and underbelly of my project management career, overlaid with my role as wife and mom. I needed a way to introduce balance, time management, and organizational skills in an already hectic life, and there they were all the time―within the tenets of basic project management, something I was already implementing every business day from 9-6. SMG: What are your thoughts surrounding project-based learning as a trend? CH: I am happy to see that “project-based learning” has gone from buzz term and hashtag to mainstream usage in the school environment. I have personally seen an uptick in the amount of project-based work my sons have undertaken during their early school years and it’s a very favorable trend. I cannot underscore enough how critical it is for young students to learn the basic life skills of cooperation, teamwork, task management, organization, time management, people management, budgeting, risk management―and these are all part and parcel of project management. SMG: This book is clearly for parents, but I can see it benefitting other audience types as well. CH: “From Homework Hell to Help!” primarily targets parents/caregivers, that’s true; however, there is a section devoted to students. I call the book a “Parent’s Guide,” as it’s geared towards the parent/caregiver working in collaboration with their student(s). And, even though it is education-related, it’s not geared toward educators, but I can see them getting sufficient usage out of this content as well. CH: This was done with purposeful, inclusive intent. I wanted to make sure I was not isolating any one group who holds this very important role. In the end, this book is for parents, whether they be: stay-at-home, working, single, military, special needs, adoptive, custodial—any singular or pair of individuals who are responsible for a child or children in grades K-12. At the same time, the “child” or “student” I refer to in the book embraces all inclusive types and neurodiversity. So, whether you have a child on the spectrum, or one with ADHD, these same modalities can be applied, and there are also some strategies that may be more effective for those with certain propensities, such as being more visually oriented. SMG: I think you have a unique opportunity here that inadvertently markets to some other unsung audience members: the wannabe personal or professional project manager! CH: That’s right! It’s inferred with my second, unofficial subhead inside the book: “Plus: The quickest possible ramp-up for everyone else on using project management in your everyday life!” If you’re a wannabe professional project manager, this is a great 101 that won’t bore you to tears; it takes the project management-babble and explains concepts in real-world terms that everyone can understand. And, if you’re just a person who’s looking for ways to better manage your time and be more organized, several of the problems and solutions can be flipped and used to apply to your situation. Many others can be used directly, such as how to manage successful meetings, Outlook and email shortcuts and tips to help you work more quickly, how to write effective notes, and helpful time-saving apps. SMG: Another thing that struck me while reading this book is how it is structured, which is unique. Can you talk a bit about that? CH: Sure. The book, while containing background information on what project management is to set the tone, is structured around project subject matter, with a problem/solution-based schema throughout. So, for example, if you’re looking at the section covering how to work with others (aka teamwork), you will see problems that a child might encounter on this topic, such as: “My child has taken on a leadership role and is not meshing well with others.” Then, I offer real-world, easy-to-consume solutions extrapolated from project management principles to be used to solve those problems. SMG: You mentioned giving some background information on what project management is. Do you feel people still generally need an explanation of what it is, and why do you think that is? CH: Absolutely. As you and I both know well, being practicing project managers for the many years we have being doing so, there pervades a sense of mystery, misconception, and stigma surrounding the practice of project management. And, I hoped I have helped to crush those mysteries, misconceptions, and stigmas! I included an opening section on how I explained what the concept of project management was to my sons, who were the first to pose this basic question to me. I also go a bit into how project management evolved, for a significant historical perspective, as well as the benefits of project management, to give parents and students as sense of WIIFM. SMG: Excellent. So, what’s next for you? CH: Other than marketing this book, I am thinking of jumping into a new one, this time focused on helping future project managers to break into the field. I eventually would like to publish some of my fiction works, but that will have to be backlogged until there’s a bigger aperture of time. SMG: Speaking of time, thanks for sharing yours with me, Chris! Where can readers find your book? SMG: Would you like to also share where readers can get in touch with you? Also, I can be reached via email at: authorchrishare@gmail.com. I love to hear what my readers think, so drop me a line and let me know your thoughts!